Known as the Bulb Capital of the World, Nieuwoudtville is considered to be ‘must’ on any travellers bucket-list. With over 1300 species of plants, this charming village with its sandstone buildings will take you back in time. Come August and September, Nieuwoudtville and its surroundings are full of vivid colours and activity, with flower routes, hiking trails, Quiver trees and waterfalls. For more info about Nieuwoudtville and more listings of accommodation visit www.nieuwoudtville.com to help you find the write place for your needs. •Nieuwoudtville waterfall 7 km out of town, dry during summer to autumn. •Quiver tree forest 25 km out of town, the second largest Quiver tree forest in the world. 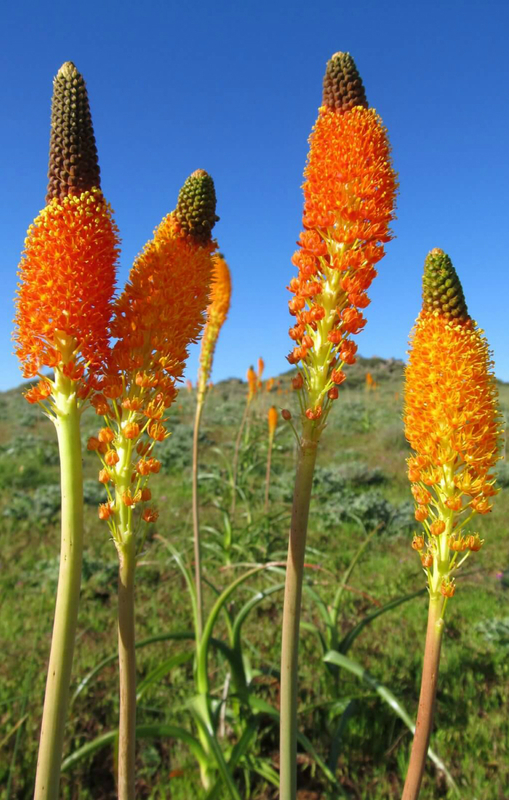 • Nieuwoudtville wildflower reserve is stunning during August & September. •Glacial pavement 6km out of town on the Oorlogskloof road. •Protea Motors, a nostalgic garage in town full of vintage motorbikes. •Willemsrivier family museum and the first church. •The character-filled Dutch Reform church located in town and built from Sandstone. A delightful self-drive tour of old farms, buildings built with sandstone. • Various flower routes during the flower season, August & September.